Numbers don’t always tell the whole story – and that’s especially true when you’re talking about site analytics. It’s easy to fall for performance metrics that seem to suggest a high rate of engagement, but context is key when trying to discern what these figures are actually saying. 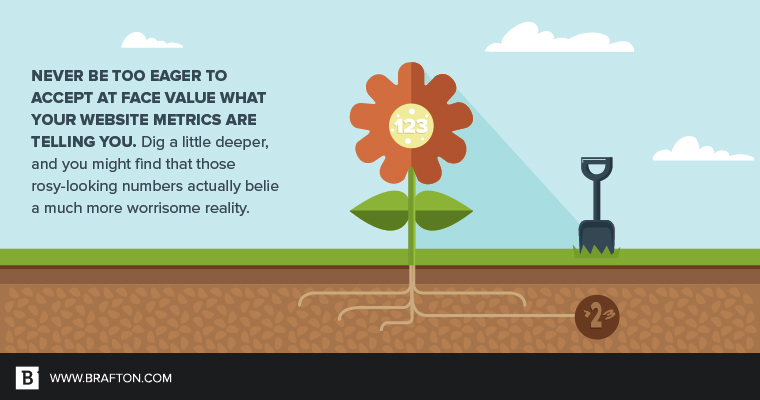 Never be too eager to accept at face value what your website metrics are telling you. Dig a little deeper, and you might find that those rosy-looking numbers actually belie a much more worrisome reality. Without a doubt, there’s no bigger site performance deception than average session duration. At first glance, average session duration seems straightforward enough: It’s the average amount of time visitors spend on your site. For reference, our 2017 Content Marketing Benchmark report covering various industries discovered that the average session duration came out to 2 minutes and 17 seconds, with the health care sector leading the pack. That should be pretty indicative of how engaging people find your content and overall website, right? As many Google Analytics experts have pointed out, ASD isn’t always a reliable indication of how much visitors enjoy your content or how easy it is to navigate from one page to another. That’s because – as its name so helpfully suggests – ASD is an average of various metrics pertaining to vastly different parts of your website with different intentions and goals. That means average session duration might not be indicative of how well your site is performing. The reality is that average session duration metrics can be easily manipulated by user activity that really has no bearing on your site’s level of engagement. Take, for instance, someone landing on one of your pages, reading a bit and then walking away from their computer for 15, 20, maybe even 30 minutes. We’ve all done it. Heck, I’ve got a dozen tabs open right now that I haven’t gone back to in hours. Just imagine what I’ve been doing* to those sites’ GA metrics. *Well, not too much damage, because Google Analytics times out after 30 minutes of inactivity, but you get the point. Regardless, that interaction can really tilt the scales on ASD, but it in no way implies strong engagement. If anything, it might suggest the opposite. That person was so bored out of their skull that they couldn’t even be bothered to close the tab – they just got up and walked away. It’s true that you can curb these kinds of extreme variations by having your site set up to time out sessions after a certain amount of time has elapsed. Even with that function in effect, there will still be some amount of idling that is being factored into your ASD. It’s helpful, to be sure, but in no way does it completely address the problem. Another major concern is how bounce rates affect your average session duration. As Analytics Edge noted, Google really has no way of knowing when one-and-dones left your page, only that they did. Because it can’t definitively calculate that value, it puts it down as a “0” – an understandable solution, if not the most elegant. Unfortunately, that doesn’t help you much. You have no idea how long that person stayed on the page before leaving. There are some workarounds to give you a more accurate sense of ASD, though. Pace’s Aditya Sharma recommends creating your own metric to account for the exit rate as well as the bounce rate. That can be done by going into the “Calculated Metrics” section of your GA dashboard and writing your own formula. If you blindly accept your average session duration metrics as gospel, your content marketing is going to suffer. Instead, consider the context of different sessions to understand what they really imply. Now, that doesn’t necessarily mean you should chalk up every 20-plus-minute session to the visitor dozing off in front of the computer, but a little bit of healthy skepticism never hurt anyone. One of the most important factors to keep in mind is the function and purpose of each page on your site and how they impact your ASD metrics. The goal of your company blog is very different than, say, a white paper download page. Someone spending a long time filling out a “Contact Us” form, for instance, isn’t necessarily a good sign. That shouldn’t take more than a minute, tops. Ultimately, you have different expectations for certain pages on your site, and average session duration alone will not reflect that. First of all, we’re not suggesting you ignore average session duration altogether, only that you take some of its implications with a grain of salt and examine the context of those figures before making any sweeping assumptions. Second, bounce rates remain a pretty bulletproof metric of site performance. If a wide variety of pages have high bounce rates, for example, that’s a pretty strong indicator that something is off with your website. Even then, there are caveats to keep in mind. High bounce rates are to be expected when there are spikes in new user activity. If you’ve recently made changes to your site or content strategy that have resulted in a surge of organic traffic, you should expect to see an increased bounce rate. The moral of the story here is don’t believe everything you read. Except for this blog, of course. This has all been 100-percent true. Every word of it. OK, maybe not the part about leaving 12 tabs open all day long. I’m not a monster.